Over the last few years, I’ve opened more than a few doors; it’s time for another…I’m a closet knitter. Yes, I LOVE TO KNIT. More than that, I’ve always loved the crazy tangle that my ends can get into. Why, why do I love the tangle so much and why can I spend hours happily sorting out the tangle. It’s something I’ve always loved…even as a child, I liked to work out the different threads and get them organized and usable. From there I could make something cool, useful and hopefully beautiful. There’s a famous story of Alexander the Great being confronted with the Gordian Knot, an enormously complex knot tying an ox-cart to a stake. The legend states that whoever could untie the knot would rule the kingdom. So far this is my kind of story. Alexander takes out his sword and chops the knot in half declaring himself ruler. I’ve always thought he cheated. Now, as I get a little older, I’m not so sure. How much of my life has been about dealing with the insanely complex mess that things can get into? TOOO MUCH! It’s time to find ways to cut through the knots and move forward. I grew up hearing the phrase “taking the easy way” as a criticism – now I wonder why anyone would intentionally take the hard way…but I often have and I’ve done it proudly. I’m coming to the conclusion that I need more balance in this part of my life. 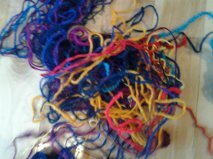 I’ve decided I like the tangle, it’s beautiful, but from now on when I want to knit something, I’m going to spend a bit of cash and buy some new wool. Some messes and tangles need to be sorted out, sometimes they need to be sliced through, sometimes they need to be ignored (or enjoyed) so I can move in the direction I need to go.